It was long thought that during an embryo’s first cell division, one spindle is responsible for segregating the embryo’s chromosomes into two cells. EMBL scientists now show that in mice, there are actually two spindles, one for each set of parental chromosomes, meaning that the genetic information from each parent is kept apart throughout the first division. Science publishes the results – bound to change biology textbooks – on 12 July 2018. Video revealing how the two parental genomes (labelled in pink and blue) remain spatially separate throughout the first cell division (text continues below). Mitosis is the process of cell division, when one cell splits into two daughter cells. It occurs throughout the lifespan of multi-cellular organisms but is particularly important when the organism grows and develops. The key step of mitosis is to pass an identical copy of the genome to the next cell generation. For this to happen, DNA is duplicated and organised into dense thread-like structures known as chromosomes. The chromosomes are then attached to long protein fibres – organised into a spindle – which pulls the chromosomes apart and triggers the formation of two new cells. The spindle is made of thin, tube-like protein assemblies known as microtubules. During mitosis of animal cells, groups of such tubes grow dynamically and self-organise into a bi-polar spindle that surrounds the chromosomes. The microtubule fibres grow towards the chromosomes and connect with them, in preparation for chromosome separation to the daughter cells. Normally there is only one bi-polar spindle per cell, however, this research suggests that during the first cell division there are two: one each for the maternal and paternal chromosomes. Furthermore, the knowledge from this paper might impact legislation. In some countries, the law states that human life begins – and is thus protected – when the maternal and paternal nuclei fuse after fertilisation. If it turns out that the dual spindle process works the same in humans, this definition is not fully accurate, as the union in one nucleus happens slightly later, after the first cell division. 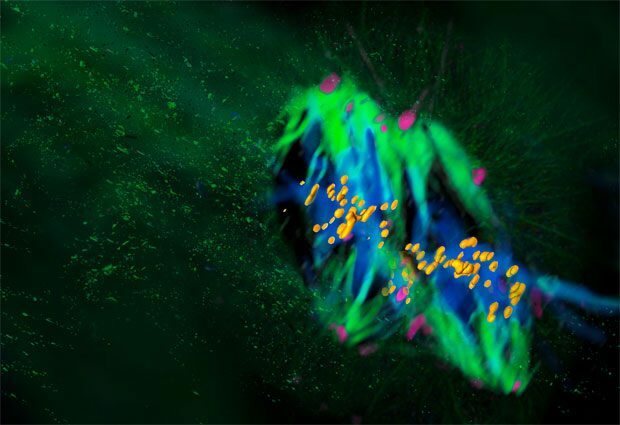 This discovery would have been impossible without the light-sheet microscopy technology developed in Ellenberg’s and Lars Hufnagel’s group at EMBL, which is now available through the EMBL spin-off company Luxendo. This allows for real-time and 3D imaging of the early stages of development, when embryos are very sensitive to light and would be damaged by conventional light microscopy methods. The high speed and spatial precision of light-sheet microscopy drastically reduce the amount of light that the embryo is exposed to, making a detailed analysis of these formerly hidden processes possible. This work was supported by the ERC Advanced Grant “Corema” (grant agreement 694236) and by the European Molecular Biology Laboratory. The authors were further supported by the EMBL Interdisciplinary Postdoc Programme (EIPOD) under Marie Curie Actions COFUND; by the EMBO long-term postdoctoral fellowship and EC Marie Sklodowska-Curie postdoctoral fellowship; by a Boehringer Ingelheim Fonds Phd fellowship, and by a Humboldt Foundation postdoctoral fellowship. Reichmann, J. et al. Dual-spindle formation in zygotes keeps parental genomes apart in early mammalian embryos. Science, published online 12 July 2018.